Aight, everyone. I was trying to find the Captain Morgan Parrot Bay 90 proof at the local liquor store (couldn't find it), but I ended up coppin' the Malibu Black. The regular Malibu Rum is more of a girly drink at only 42 proof, but this one is more of a regular rum at 70 proof. - a smooth go down and slight burn. Great for sipping neat or on ice. 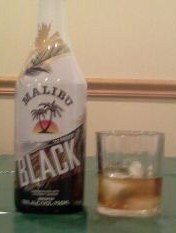 - coconut after taste is apparent and a bit more natural coconut than the regular Malibu Rum. Almost feels like a dark rum completely. Overall, this was a very pleasant experience. It was pretty good tasting. Has a better buzz and lasting finish than the typical Malibu Coconut Rum. A slight burn and a pleasant mix of a caramel/coconut feel to it. The rum definitely has more body, too. Overall score: 7.8/10. Solid! Depending on your liquor store you'll probably pay out around 12-15 bucks for the 750mL. Here's a video review that Derrick Schommer from Common Man Cocktails came up with earlier in the year. Enjoy!